If you’ve ever been lucky enough to visit our 50th state, you know first-hand of the delight of the traditional welcoming ceremony. Beautiful island women in Hawaiian garb greet you at the airport, placing wreaths of fragrant flowers around your neck. For the entirety of your stay, this aroma envelopes you wherever you travel. For the most part, the leis are woven of plumeria, also known as Frangipani, and the plumeria smells like no other plant in the world; each color has its own unique fragrance. Some smell sweet, while other colors carry the perfume of jasmine, peaches, or citrus. The plumeria is native to the Caribbean, the Pacific islands, South America and Mexico, where they can grow to a height of 30 to 40 feet. In slightly more temperate climes, they will grow to be large shrubs or small trees. Plumerias grow well in Southern California if temperatures in your area generally stay above 40 degrees. They grow best with daytime temperatures in the 80s and 90s and nighttime temperatures in the 60s and 70s. Plumeria are the tropical plants with fragrant flowers that Hawaiians use to make leis. They flower profusely and the flowers last for a long time both on the plant and as indoor bouquets. You will start seeing Plumeria in nurseries around this time of year. Choose a site for your plumeria that is in full sun. Plumeria produce the most flowers if they are growing in full sun. They will grow in the shade, but they will produce more foliage and fewer flowers. The soil should be sandy and well drained. Don’t plant them anywhere the soil is soggy. Plumeria grow well alongside cacti and succulents, in fact, using a good Cactus soil mix is a good choice when planting. Dig a hole slightly larger than the root ball of the plumeria you are planting. Place the root ball into the hole and gently firm the soil when back filling. Give it a little water to settle the soil around the roots, but don’t soak it. Choose a medium to large pot, depending on how large your transplant is and how large you want your plant to grow. You can always move to a larger pot later. Carefully transplant the plant by loosing the soil around the container it came in. Place the entire plant, soil and all, into the new pot. Center the plant and fill around the existing soil with a well draining potting soil such as Kellogg® Palm and Cactus Mix. Place some on top of the soil. Plumerias need a high phosphorus fertilizer during the growing season; generally around April through October or to put in other terms, as it starts to get warm until it gets cold. Fertilize growing plumerias once a month with low nitrogen, high phosphorous plant food, using one tablespoon per gallon pot. For plants in the ground, Gro Power® Flower and Bloome 3-12-12 will work well. Apply at a rate of 1 pound per inch of trunk diameter, spread evenly to the drip line of the plant. Depending on your soil type 2 to 3 applications a year is sufficient. Read the label for detailed instructions. During the winter season in Southern California, don’t water or feed your plumeria. They naturally go dormant and will survive without them. Be sure to keep your potted plumeria warm by moving closer to the house or warmer area. Use frost cloth at night for plumeria in the ground. 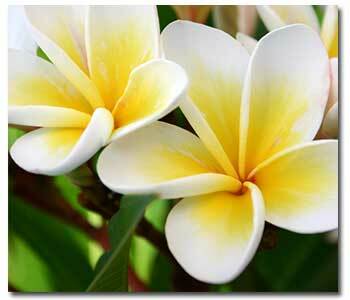 Plumeria are tropical plants that suffer when exposed to temperatures below 50 degrees. Exposing them to temperatures below 40 degrees is usually fatal. However, well-established, healthy plumeria can withstand short periods below 40 degrees without serious setback.